Due to an unfortunate event in my life - aka The Fountainhead, I do not have a new book to report on this week. I am a huge advocate of the Running Log (see the sidebar on this blog). What you may not know, is that long before the Running Log, I was all about the Reading Log. I have been keeping record of all the books I've read since January 2001. That was mid-8th grade. A LONG time ago. There are a few reasons I am so into Logs. a) I like to keep a record of what I've done to look back on. b) It's satisfying to finish a book and record it. (Same feeling as logging a run). It makes it feel like it really happened. Because if you don't write it down, and then completely forget about it, it's kind of lost, right? c) When friends ask for book suggestions, I can look back and remember which ones I liked. d) I'm a teeny-tiny bit OCD. e) And I'm really glad that I now have this almost-9-year record of books I've read. 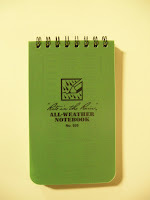 - My reading log is an unassuming small green notebook. Nothing fancy. - When I finish a book, I write down the title and the author. That's all. So get logging! To prove my point that logging is useful, here is a list of my most-read books - available to you thanks to my star system. Most of these books come from pre-college, just because college reading really cut into my own personal reading ventures. But that doesn't mean they're not good!